There are some changes coming with Mists of Pandaria . The Cataclysm talent system has been completely scrapped in favor of a newer, simpler one. Many of the old talents are dead and gone, as are some of the abilities. Others have changed a bit or become the new talents or abilities. The Prime Glyphs slots are gone, but some of those glyphs have been rolled into the Major glyphs. Minor Glyphs are now pretty much cosmetic only. The wand slot is gone, though you can still use wands. Release is still a month away, so some changes will still be coming. We’ll update appropriately as we find them. Comments? Thoughts? Questions? Use the comment box at the bottom of the page. Talents have changed, big time. The talent page. This is about what you will see when you check the talents on your Priest. Any Priest spec can pick any one talent from each row. You will have six total talents at level 90. All of the old talents (and some of the old abilities) have been either slain or rolled into these talents or the current abilities. Some of these have obvious PvP use or are utility talents. 86+ Tome of the Clear Mind. Movement Angelic Feather – place feathers at up to three locations, people moving through the feathers get a speed buff. You can also cast it right on a target and on yourself. With a litle care this looks like it could be quite useful. Body and Soul increases the target’s movement speed, briefly, when you cast Power World Shield or Leap of Faith on them. Phantasm greatly improved your Fade ability and looks like it’d be very nice in PvP. Healing & Damage From Darkness Comes Light – Vampiric Touch ticks give a chance for a free, instant, Mind Blast with increased damage and that doesn’t consume your DoTs. Mindbender replaces your Shadowfiend. It’s attacks restore your mana. Power Word: Solace – damages and enemy and restores a bit of mana. SOS Desperate Prayer instantly heals your for 30% of your health. 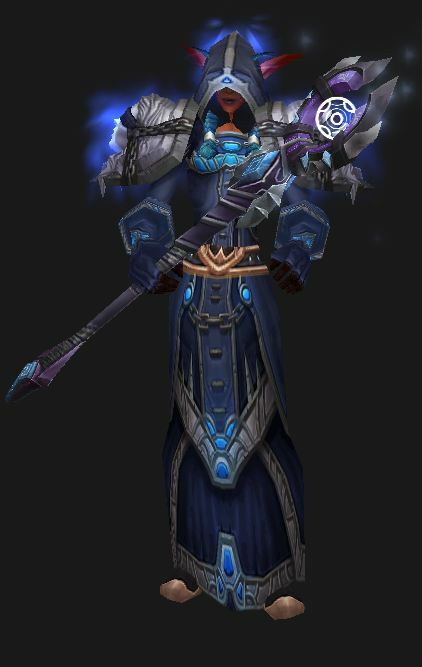 Spectral Guise improves your Shadowform and looks sweet for PvP. Angelic Bulwark throws up a shield to protect you when you go below 30% health. Again, this looks like more PvP use than PvE. Bonuses Twist of Fate – Finish Him! you do more damage as the target gets low in health Power Infusion increases casting speed and reduces mana costs for 20 seconds. Nice for when that burst is needed. Divine Insight: Your SW; Pain ticks have a chance to proc free Mind Blasts. A of E Halo: A Ring of Power extends outward from your location damaging enemies and healing friends and doing max power at 25 yards. This one just sounds cool and might a pretty nice in a raid or mass fight. Cascade: Your Holy Bolt bounces from target to target, doing damage to each, preferring longer range targets and never hitting the same one twice. Divine Star: Your star blasts outward, staight away from you, damaging enemies and healing allies along its path, and does the same on its return. 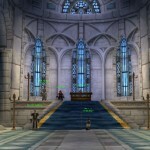 All Priests will receive all of these abilities at the appropriate level. New or greatly changed talents are linked. 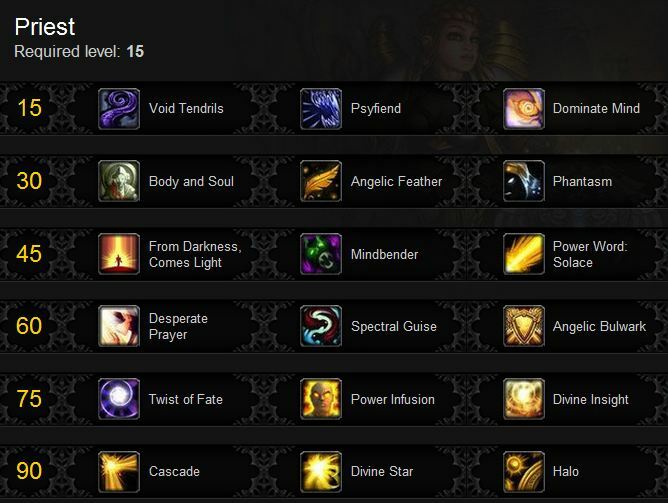 Some of the old abilities have moved to become specialization abilities. Shadow Word: Pain 4 Blessed Healing gone? Void Shift 87 New. Health swap. Some of the old talents have been moved, others have died. Some of the dead talents are dead in name only, their effects having been moved to other talents. As mentioned above the Prime glyphs are gone. Major glyphs now enhance the functionality of your spells and the minor glyphs offer cosmetic changes. All glyphs are level 25 and you can only have three of each, total, at level 75+.